Going to a car dealership is a notoriously intimidating, awkward, stressful experience. You’re dealing with someone whose actual job is to swindle as much money out of you as possible, and if you’re not over-prepared, there’s a strong chance the dealer will rip you off with one of their many manipulative Jedi mind tricks. How close are we to virtual reality car buying replacing the archaic torturous practices of the traditional dealership? And more importantly, would you really order a car you didn’t actually drive first? Virtual reality has come a long way since the god-awful cyberspace tech featured in Aerosmith's 1994 "Amazing" music video. Some even argue that VR is nearly ready for primetime. 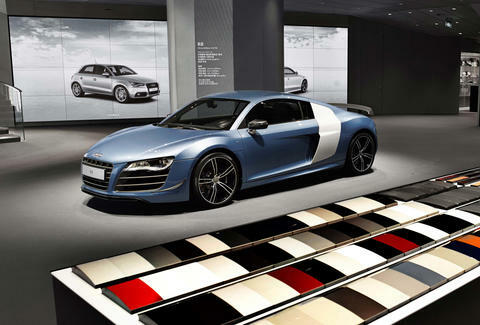 A handful of automotive companies certainly seem to think so, anyway; not only Vroom, but also Audi. You can step into one of a few select Audi dealerships (in Germany, but coming soon in the US) and configure a dream car like the V10-powered R8 supercar using virtual reality. Not to be outdone, even Cadillac is planning to experiment with virtual dealerships with no physical cars to drive. It may sound far-fetched, but incorporating VR technology into the car-buying process actually comes with some pretty righteous perks. Not having to deal with a a car dealer alone could justify the cost of an Oculus Rift, HTC Vive VR, or the upcoming Project Morpheus headset. VR will work best to enhance a super-simplified car-buying process like Vroom's -- the company sells used cars online and at a fixed price. Customers can get all the details of a vehicle (specs, price range, performance, even comparable vehicles) just like they can on a normal website, but in a more engaging and interactive manner. There are no negotiations, and Vroom delivers the car directly to the customer at the time of his or her choosing. VR seamlessly bolsters the sales model, which means Vroom's virtual showroom concept may actually work -- once the company gets its Sony PS1-level graphics sorted out. 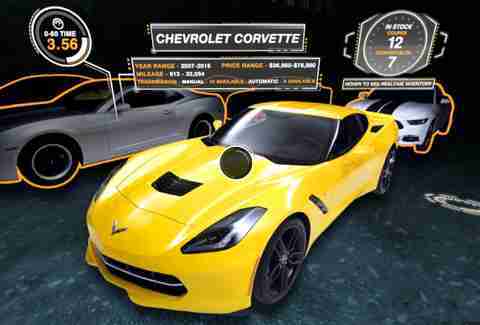 Virtual reality showrooms could also be a useful tool for the pre-sales of vehicles that have been announced but not yet brought to market. 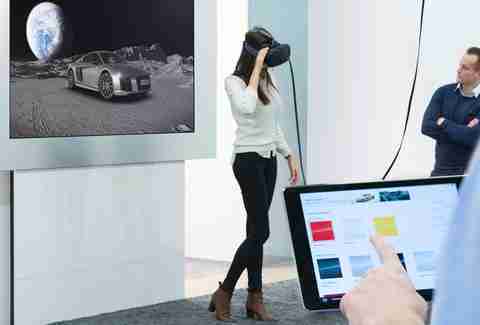 Last year, Audi announced its intent to use VR to give customers an immersive experience that accurately portrays the styling, proportions, and feel of the car they want, even if there's not one directly on hand. That initiative is currently in the roll-out process, and it's not hard to see the benefits for not just Audi, but companies like Tesla that don't have regular dealerships, or even enough inventory to go around. On the flip side, there are a few reasons VR is bad for car shoppers: it’s not mainstream, dealers will likely ruin it for everyone, and virtual reality isn’t likely to trump actual reality anytime soon. If virtual reality does take off and hit mainstream, however, then you can bet your bottom dollar that savvy car dealers will find a way to inject human versions of Clippy into the experience, only instead of annoying-yet-helpful "hints," they'll be trying to sell you a real car in a virtual world. Audi is certainly trying to expand the ways its clientele can interact with vehicles in a virtual setting, and Vroom has a "test drive" feature, but with current technologies, a realistic test drive is not something that can be replicated in a VR environment, nor will it be anytime soon. Gazing at animated vehicles in a 3D warehouse is impressive, at least technologically, but it is not, and arguably never will be, the same as putting your tush in the driver’s seat and running through the gears... engaging your entire body and mind in the process. At the end of the day, most customers need to establish an emotional connection with the second largest purchase of their lifetime. Unless that purchase is a Tesla, in which case, sure, why not put down $1,000 on a car you've never seen and wait around a few years. A car is a big chunk of change -- whether new or used -- so it remains important to inspect the quality of the materials, the ride, and the overall practicality of a vehicle. Assuming you actually care about these things [Editor's Note: You'd better! ], the only way that can happen is buying the car through a series of potentially uncomfortable face-to-face interactions... you know, at a non-virtual dealership. The tech is making progress, and it's becoming more affordable and accessible all the time. At this stage, though, a VR dealership is essentially a gimmick to show customers that the business is forward-thinking. To date, sales of devices that support VR haven't exactly made it a household experience. That's not to say a version of these types of headset devices couldn’t become the next iPhone, but it’s a long way off, to say the least. How consumers shop for cars now is heavily reliant on information they source from their friends and family. They rely on the perspectives of peers to validate and verify shopping decisions. But the future looks different. We'll be even less connected to other humans (at least in the physical sense). By that time, Tesla may have influenced and overhauled the traditional dealership model, and we might all be buying both used and new vehicles online at our convenience. Beyond that, as VR evolves, we can expect a much more interactive process than the 360-degree rotating car image on a flat computer screen. 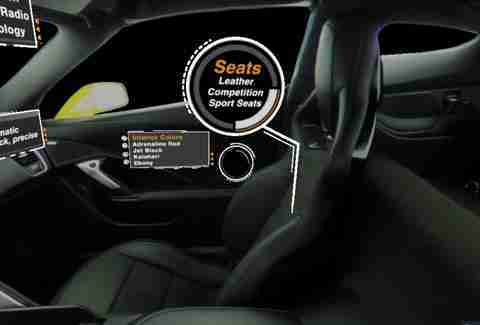 It is then that we will truly see the value of VR in shaping the car sales process. Until then, we will have to settle for conducting most of our business in real life.